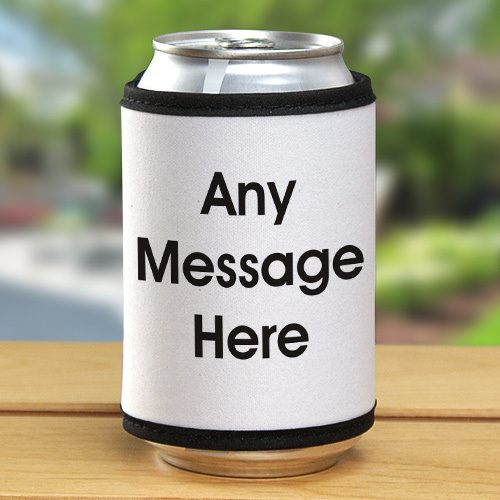 Your favorite beverages will look Cool and stay Cool with these uniquely Personalized Message Can Wraps. All of the people attending your summer party will enjoy a ice cold beverage from their own Personalized Can Cooler while enjoying the sunshine and great fun. Buy a personalized set for a special personalized housewarming gift idea. Your Custom Printed Any Message Can Cooler measures 4" x 9 1/2" with velcro closure around your beverage bottle or can. Personalized can & bottle holder includes FREE Personalization! Personalize your Message Can Wrap with any three line custom message and choose between 10 vibrant colors. I order this for my brother he love it. This was a lot of fun, and there was plenty of room for a message... our bday fella loved it! A little flimsy (which is why I'm giving it 4 stars).